Join the discussion on our forums! Come discuss Ticket Scalper over in our dedicated Ticket Scalper discussion topic. This artwork seems really weird. She looks kinda like a mixture of an orc, a goblin and a troll. Do the artists even play this game? Love the art! Reflects the theme of the pack really nicely. So... will this work with Shadowflame? Nope, that won't work, either. You can't cast Betrayal on your own minion, so it'd have to be your opponent's Betrayal. Except that doesn't work, either, because overkill only is active on your turn. So really the only way to cheese this is to play it against your opponent's injured Swamp King Dred. It's rather a midrange/aggro card. It can snowball and has high dmg counter. 1. It's very good when buffed with rush. 2. It has high kill priority minion which as we all know is what every aggro and midrange deck demands. In my opinion, this is actually a strong card given its snowball potential (when buffed with a divine shield or + HP) AND high dmg counter. 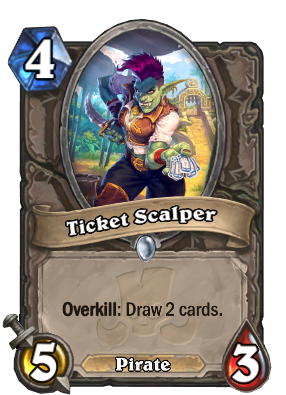 I am calling it, Overkill as a mechanic will be dead upon arrival just like magnetic and inspire. It is just to "fair" of a mechanic, it does not activate on your opponents turn, it is a mechanic that can be played around and the only way to make this mechanic to work is to.... Overkill it with the power level which i do not believe will happen. this only works while attacking correct? not when being attacked into by the opponent? Terrible unless it has rush... You're gonna need a very reliable way to give it rush. Commanding Shout madness anyone? Pirate decks with draw mechanics... What world we are living in? Technically that could work, considering we might be able to play Dread COrsairs alongside it as protection. not sure if overkill would proc during your opponent's turn or only during your turn when you attack. "Cards can only activate their Overkill effects on the controlling player's turn." This is on the Hearthstone Wiki page. Just thought I'd share, because I was wondering the same!